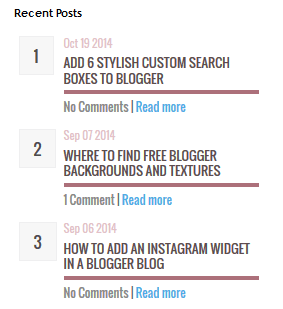 Recent post widget for blogger is one of the most important widget which displays recently posted article's links. Having a recent post widget inside your blog it might be very useful to your readers to navigate to the new articles or to let them know that your blog have a new article available to read. Whenever, you made a new post to your blogger blog, the link to that post will be added to the recent posts widget automatically. Apart form this there are too many other benefits of having a recent post widget to the blog, Well, if you are looking for the same then here are 5 cool recent post widgets for blogger blog that you can choose according to your choice and your blogger template. How to Add Recent Post widget on Blogger? Paste the code of chosen widget into it. Finally, Hit the "Save" button and you're done !